Upon seeing the newly produced vignette from Konrad Schulte of Fredericus Rex, although not a fun of the period, I was instantly taken by its beauty. The Prince mounted onto his proud white horse is talking to a shy young lady while her father paying his respect to the Prince and the rest of the family observing the obviously rare incidence of meeting with a Prince. 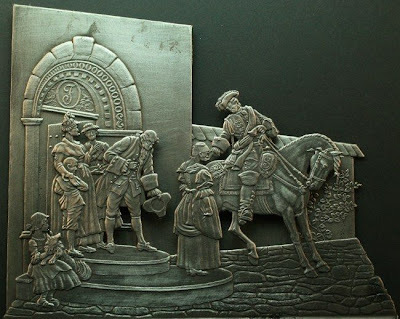 Designer is Mr Schulte himself while the engraver is Daniel Lepeltier. So by now you know what to expect in respect of quality of the piece. Simply first rate. Oh, I forgot to mention it’s a one-side only engraving. The painting upon which the vignette was inspired. Ok, but who was this man you might ask. Well I didn’t know also so I had to look through internet to try and find some things about his life. Here is a sort story that helps to understand who was this man and what were his achievements in life. LEOPOLD I, Prince of Anhalt-Dessau (July 3, 1676 – April 7, 1747), called "the Old Dessauer" (der alte Dessauer), General Field Marshal in the Prussian army, was the only surviving son of John George II, Prince of Anhalt-Dessau, and was born at Dessau. From his earliest youth he was devoted to the profession of arms, for which he educated himself physically and mentally. He became colonel of a Prussian regiment in 1693, and in the same year his father's death placed him at the head of his own principality. Thereafter, during the whole of his long life, he performed the duties of a sovereign prince and a Prussian officer. His first campaign was that of 1695 in the Netherlands, in which he was present at the siege of Namur. He remained in the field to the end of the war of 1697, the affairs of the principality being managed chiefly by his mother, Princess Henriette Catherine of Orange. In 1698 he married Anna Luise Rise, an apothecary's daughter of Dessau, in spite of his mother's long and earnest opposition, and subsequently he procured for her the rank of a princess from the emperor (1701). Their married life was long and happy, and the princess acquired an influence over the stern nature of her husband which she never ceased to exert on behalf of his subjects, and after the death of Leopold's mother she performed the duties of regent when he was absent on campaign. Often, too, she accompanied him into the field. Leopold's career as a soldier in important commands begins with the outbreak of the War of the Spanish Succession. He had made many improvements in the Prussian army, notably the introduction of the iron ramrod about 1700, and he now took the field at the head of a Prussian corps on the Rhine, serving at the sieges of Kaiserswerth and Venlo. In the following year (1703), having obtained the rank of lieutenant-general, Leopold took part in the siege of Bonn and distinguished himself very greatly in the battle of Hochstadt, in which the Austrians and their allies were defeated by the French under Marshal Villars (September 20, 1703). In the campaign of 1704 the Prussian contingent served under Prince Louis of Baden and subsequently under Eugene, and Leopold himself won great glory by his conduct at Blenheim. 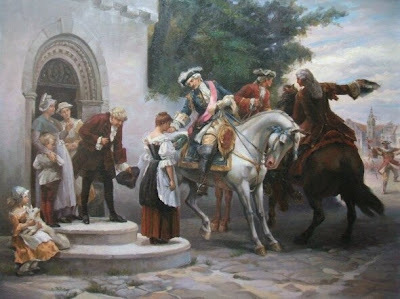 In 1705 he was sent with a Prussian corps to join Prince Eugene in Italy, and on the 16th of August he displayed his bravery at the hard-fought battle of Cassano. In the following year he added to his reputation in the battle of Turin, where he was the first to enter the hostile entrenchments (September 7, 1706). He served in one more campaign in Italy, and then went with Eugene to join Marlborough in the Netherlands, being present in 1709 at the siege of Tournay and the battle of Malplaquet. In 1710 he succeeded to the command of the whole Prussian contingent at the front, and in 1712, at the particular desire of the crown prince, Frederick William, who had served with him as a volunteer, he was made a General Field Marshal. Shortly before this he had executed a coup de main on the castle of Mors, which was held by the Dutch in defiance of the claims of the king of Prussia to the possession. The operation was effected with absolute precision and the castle was seized without a shot being fired. In the earlier part of the reign of Frederick William I, the prince of Dessau was one of the most influential members of the Prussian governing circle. In the war with Sweden (1715) he accompanied the king to the front, commanded an army of 40,000 men, and met and defeated Charles XII. in a severe battle on the island of Riigen (November 16). His conduct of the siege of Stralsund which followed was equally skilful, and the great results of the war to Prussia were largely to be attributed to his leadership in the campaign. 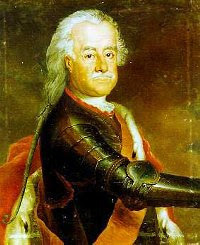 In the years of peace, and especially after a court quarrel (1725) and duel with General von Grumbkow, he devoted himself to the training of the Prussian army. The reputation it had gained in the wars of 1675 to 1715, though good, gave no hint of its coming glory, and it was even in 1740 accounted one of the minor armies of Europe. That it proved, when put to the test, to be by far the best military force existing, may be taken as the summary result of Leopold's work. The "Old Dessauer" was one of the sternest disciplinarians in an age of stern discipline, and the technical training of the infantry, under his hand, made them superior to all others in the proportion of five to three (see War Of The Austrian Succession). He was essentially an infantry soldier; in his time artillery did not decide battles, but he suffered the cavalry service, in which he felt little interest, to be comparatively neglected, with results which appeared at Mollwitz. 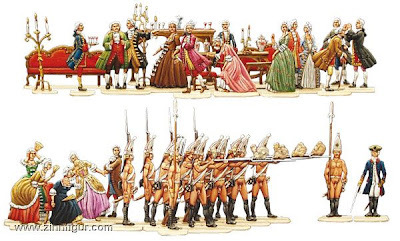 Frederick the Great formed the cavalry of Hohenfriedberg and Leuthen himself, but had it not been for the incomparable infantry trained by the "Old Dessauer" he would never have had the opportunity of doing so. Thus Leopold, heartily supported by Frederick William, who was himself called the great drill-master of Europe, turned to good account the twenty years following the peace with Sweden. During this time two incidents in his career call for special mention: first, his intervention in the case of the crown prince Frederick, who was condemned to death for desertion, and his continued and finally successful efforts to secure Frederick's reinstatement in the Prussian army; and secondly, his part in the War of the Polish Succession on the Rhine, where he served under his old chief Eugene and held the office of field marshal of the Empire. With the death of Frederick William in 1740, Frederick succeeded to the Prussian throne, and a few months later took place the invasion and conquest of Silesia, the first act in the long Silesian wars and the test of the work of the "Old Dessauer's" lifetime. The prince himself was not often employed in the king's own army, though his sons held high commands under Frederick. The king, indeed, found Leopold, who was reputed, since the death of Eugene, the greatest of living soldiers, somewhat difficult to manage, and the prince spent most of the campaigning years up to 1745 in command of an army of observation on the Saxon frontier. Early in that year his wife died. He was now over seventy, but his last campaign was destined to be the most brilliant of his long career. A combined effort of the Austrians and Saxons to retrieve the disasters of the summer by a winter campaign towards Berlin itself led to a hurried concentration of the Prussians. Frederick from Silesia checked the Austrian main army and hastened towards Dresden. But before he had arrived, Leopold, no longer in observation, had decided the war by his overwhelming victory of Kesselsdorf (December 1 4, 1 745). It was his habit to pray before battle, for he was a devout Lutheran. On this last field his words were, "0 Lord God, let me not be disgraced in my old days. Or if Thou wilt not help me, do not help these scoundrels, but leave us to try it ourselves." With this great victory Leopold's career ended. He retired from active service, and the short remainder of his life was spent at Dessau, where he died on the 7th of April 1747. While reading about this man I remembered a very peculiar and unique set edited by Scholtz (Berliner Zinnfiguren Serie No 100/158) consisting of 62 figures depicting a rather amusing incident which took place at a ballroom after a bet. Leopold ordered a platoon of infantry to march inside the ballroom, totally naked but fully armed and with their mitre-caps and boots on and fire a volley of shots through the windows. Weird humor indeed, but a nice idea for a boxed diorama for the all the funs out there. Set consists, besides the Prince, some gentlemen and ladies amused or disturbed by the incident, some furniture and of course the naked infantrymen.